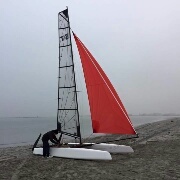 New project by Michele Petrucci, designer & builder of the great little foiling cat the “S9”. This new ‘S1’ is a solo sailing floating/semi planning cat. He calls it a semi planning cause the transom features a wide angular shape, like the S9. I have a recreational 16 with a flat wide and channeled transom we built in 2007, it works really good downwind. On the S1, its target ‘audience’ is not that clear to me, but it surely looks fun with the added gennaker. I would add Landy style winglets at least for safer downwinds and also would like to see from Michele a full powered rigged & foiling S9, or this same platform with foils. This mught a fun boat to sail for all levels. 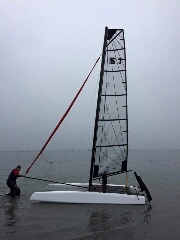 and happy for Michele on having more boats launched, in the UK contact Outlaw Sailing for a test on the S1. Below first specs and comments from Michele about this new floating mode ‘S1. Comments from Michele: ” We think top speed about up 22knots, construction is full prepreg carbon on autoclave. Hulls are epoxy fiberglass built on infusion system and spray paint finish.